It's no secret that there's a consensus that JRPG's have suffered a decline in quality this generation of gaming. Arguably it's less of a decline for JRPG's and more of an incline for WRPG's as the rise of popularity for latest installments of already established series such as The Elders Scrolls IV: Oblivion and Fallout 3, although when your genre's poster child is Final Fantasy XIII then something needs to be addressed. However, any JRPG apologist can point to the best JRPG's not getting any mainstream attention. Nippon Ichi is frequenctly brought up in this regard as its ouevre of polished strategy games, each with their own innovative battle systems and genuinely interesting storylines makes it a good example of a company that was willing to try something different with each game they made. However for as much praise as Nippon Ichi gets it is NOTHING to compare to the balls-to-the-wall insanity that Sting puts into each and everyone of their titles. The fact that Riviera is modest in comparison to the rest of their titles is a testament to how insane the game is. The plot is as generic as animé JRPG plots get. You start the game barraging into the various layers of heaven with your companion under the guidance of an archangel. The immediate difference between you and your ally's strength should make it obvious that he's not permanent but it's fun while it lasts. After that animé trope No. 4372 starts where you get separated from your friend and end up joining the opposing side culminating in a fight against the arch angel himself. Sting's plots got less formulaic as they went on with Yggdra Union's dark medieval plot that's reminiscent of Valkyrie Profile and cresting with Knights in the Nightmare. All in all it is a standard plot but as with the Tales of series, the cast of characters does enough to make it bearable. If not for the story then Sting games should be played for their highly experimental gameplay. When a battle starts you can change between melee or magic oriented, changing the formation of the characters. This sounds superficial but in order to do well in the game it needs to be accounted for. The most important thing about the combat is that the game has a weapon degradation system. It'd be fair to automatically dismiss any game with a weapon degradation system because for the most part it's usually terrible, but with Riviera it feels like a byproduct as you have to cycle through your weapons (and manage them) Vagrant Story style and it feels natural and actually rather awesome where you save up that ultimate weapon you found earlier in the game to rip through a particularly egregious boss's health. Presentation counts for a lot of the game. For an unknown company Sting did a great job with the soundtrack that creates a tone that doesn't clash with the games aesthetics. the character designs aren't anything you wouldn't have seen before (it's as though Sting had a checklist for the ideal five woman harem for the stereotypical protagonist). 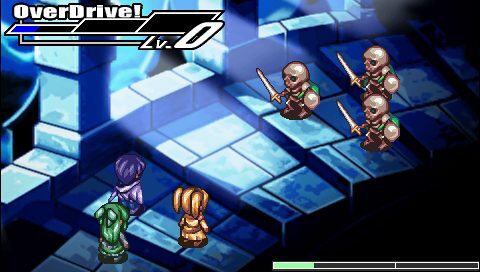 the actual enemy designs fare much better, allowing them to draw from a myriad of sources to create unique designs to set themselves apart from the standard tropes found in other JRPG's. One of the most bizarre parts of the game is that for a JRPG, it contains a lot of quick-time events. They determine whether you have enough equipment or not, whether you have enough health to fight the next boss and whether you can gain any of the unlockable extras the game has (there are ten extras in the game and in my playthrough I didn't get any of them). Whether Riviera was a success as a genuinely good video game is debatable. It's original, no denying that, but all of the elements never really mesh together to create something that can be viewed holistically. It's worth looking at from a design perspective although I'm hard pressed to recommend it if you want to have fun with it. The game was released for the GBA but later got ported to the PSP with better graphics, sound, and more options, making this the definitive version if you're that curious.